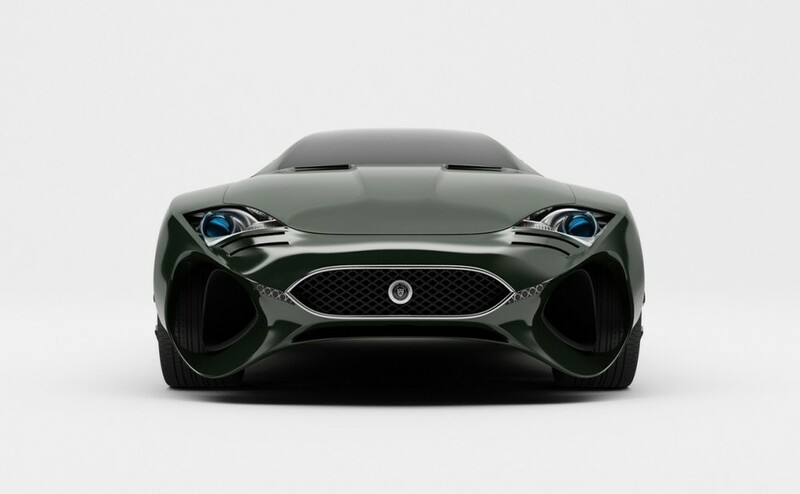 The Jaguar XKX concept car by Bahrain-based design studio Skyrilland Albanian designer Marin Myftiu, is a totally new take on the classic Jag we all have grown to appreciate over the years. Ali Almossawi, co-founder of Skyrill, explained that "the concept tries to revive the glorious design lines of the brand, combining fresh solutions, a unique, new aerodynamics, tailored around the electrical elements of the power system as well as cutting-edge energy feedback." Aesthetically speaking, the designers wanted to avoid the "heaviness associated with many of today’s muscle cars, including actual Jaguar models." Instead, the team decided to recreate a thin, elegant profile, while still showing off all the extra power and technological improvements. The XKX's profile is an organic flow of lines that look almost like the company's "pouncing cat" logo on wheels. Over on the technological side, the electronic vehicle has carefully designed aerodynamics, where air is deflected away from the engine and around the car itself, said to be 60 per cent more power efficient. Also, the entire car body is covered by a layer of piezoelectric cells. when stimulated by the pressure of air flowing over them during vehicle movement, the units produced electricity that is fed into the vehicle's battery. Genius! Designer Note: The Mirrors are another characteristic feature of the Jaguar XKX are the totally disappearing side mirrors. At about 1cm thickness, the mirrors perfectly fit the shallow hatch made in the door piece when the car is stopped and they unfold again in working position when it’s turned on. This adds to both the aesthetics, and protects the side mirrors from any damages when parked. Designer Note: Given a much smaller and cooler power plant than conventional, the aerodynamics was conceived in a new innovative way. The side deflector intakes of the front were made broader, so a much larger amount of air does not get stuck by the engine, instead, it flows behind the front wheels, getting out behind them and sliding along the doors and then taking another shortcut through the rear wheels and out from the big rear openings, greatly reducing the total flowing path and subsequently drag. Designer Note: Almost 60% of the energy used by a typical car at highway speeds is spent to counter air friction. Obviously, that is A LOT of energy spent for a function that is indispensable, but not the primary (to push the vehicle forward). The body of the XKX is covered by a layer housing microscopic ripples of piezoelectric cells, which, stimulated by the pressure of the air flowing over them (the actual air friction experienced by the car) produce electricity that is fed back to the vehicle’s battery, increasing both efficiency and performance.